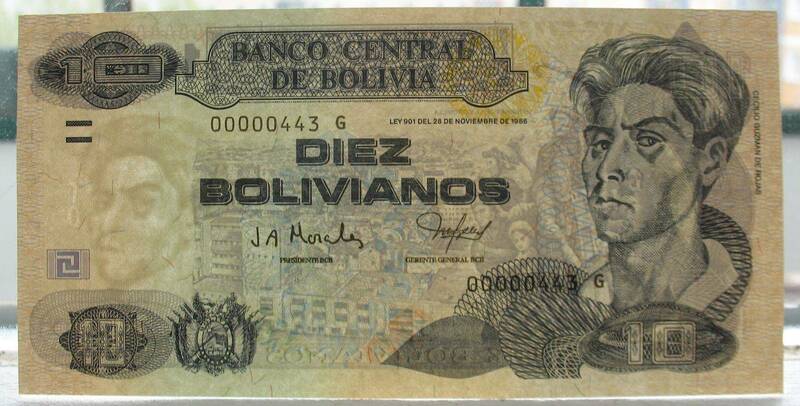 Denomination 10, portrait of Cecilio Guzman de Rojas. 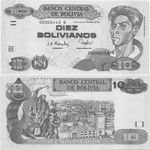 Guzman de Rojas Cecilio (October 24, 1899, Potosi, Bolivia - February 14, 1950, La Paz, Bolivia) was a Bolivian artist. He studied at La Paz, then in Madrid, at the San Fernando Academy, from 1923 to 1931 he studied and worked in Paris. After returning to Bolivia, he became director of the Academy of Arts in La Paz, then director general of the Ministry of Culture for Fine Arts in Bolivia. A typical manifestation of indichineseism in Gusamin's work is the picture "Motherhood". Rojas' authorship also belongs to the dramatic series of canvases "The Chakka War" and "The Song of the Stones". As an artist, the monumentalist Rojas painted the Paris cinema in La Paz. His portraits are also known, in which the model is depicted against the background of the Altiplano landscape, which symbolizes the spiritual unity of the inner world of the Bolivian with the surrounding nature. Guzman committed suicide in La Paz, in 1950. He was a student of Avelino Nogales and Julio Romero de Torres. 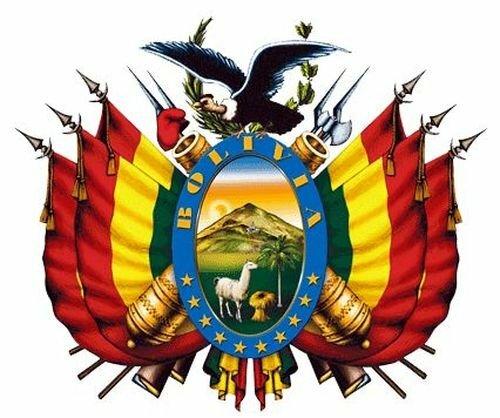 The coat of arms of Bolivia is at the bottom. The central cartouche has a border with ten stars in the bottom, which symbolize the nine Departamentos and the former province Litoral that was taken over by Chile in 1879, and the name of Bolivia in the top section. Within the border the silver mountain Potosí - recognized by a mine entrance — is depicted, with Inti in form of a sun rising above it, and with an alpaca standing next to a palm tree and some wheat. The alpaca stands on a plain that contrasts with the mountain. The mountain and its contrast with the plains are indicative of the geography of Bolivia. The llama is the national animal, related to the alpaca and the items next to it are symbolic of the resources of the nation. Around the shield there are three Bolivian flags on each side. Behind these are two pairs of crossed rifles that symbolize the struggle for independence. Next to the muskets there are an axe and a red Phrygian hood, which is the symbol of liberty and freedom. The laurel branches are symbolic of peace, and the condor perched upon the shield is symbolic of a willingness to defend the nation and its liberty. In some depictions of these coat of arms, the two pairs of muskets are replaced by two cannons. Other depictions also have more realistic symbols in the shield. Denominations in numerals are in three corners. In words centered. Monumento heroinas de la Coronilla - the part of the identity of the city of Cochabamba. Declared a National Monument on October 14, 1926; It is located on the San Sebastián Hill, south of Cochabamba. The monument made in bronze, has a height of 6 meters. and width of 2 meters. Erected as a tribute to the Heroines de la Coronilla and the independence movement of May 27, 1812. In May of that year, Goyeneche was at the head of the royalist troops and once he defeated the patriot troops under Esteban Arce I advance towards Cochabamba that prepared the resistance with very few resources. The few inhabitants of the place, mostly women, left to confront the Spanish invasion at the head of Dona Mañuela Gandarillas, who, even though she was blind, courageously commanded the female civil regiment. They barricaded themselves on the hill of San Sebastián. Finally Goyeneche entered Cochabamba on May 27, 1812, breaking the heroic resistance. So that people will never forget the value that those Cochabamba women had, this place was called "Coronilla". At the start of the hill there are two metal lions formerly these were two war guns. 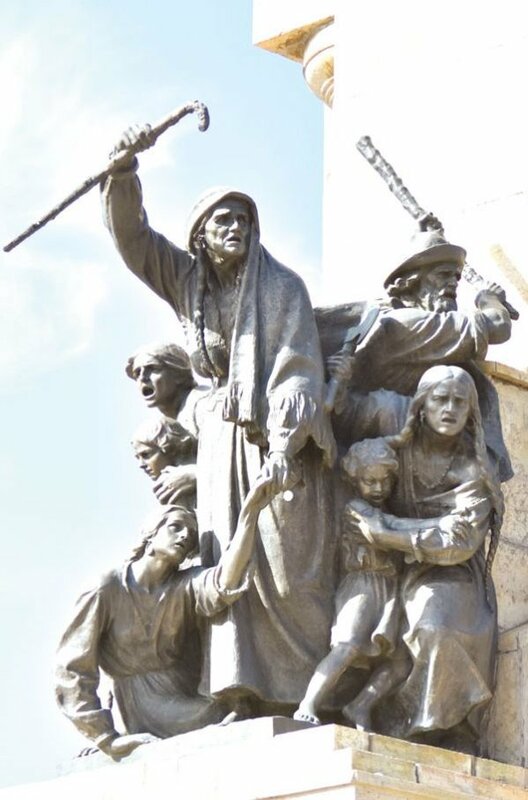 In the monument three women are represented, 2 children, an old man and in the center the figure of Manuela Gandarillas who led the battle. At the top of the monument there is a statue of Christ. Cochabamba (Spanish Cochabamba, Quchapampa Quay, Quchapampa Quechua, Qhuchapampa) is one of the largest cities in Bolivia, the capital of the same department. In translation from the language Quechua means "swampy terrain". Cochabamba is 220 km away. south-east of La Paz, in the Eastern Cordilleras in the fertile and densely populated Cochabamba Valley. The valley is surrounded by mountains, reaching 5000 meters in height. The central part of the city is on the plain, some of its districts are on the hills. To the north and west of the center flows the Rio-Rocha River, in the southeast lies Lake Laguna Alalay. 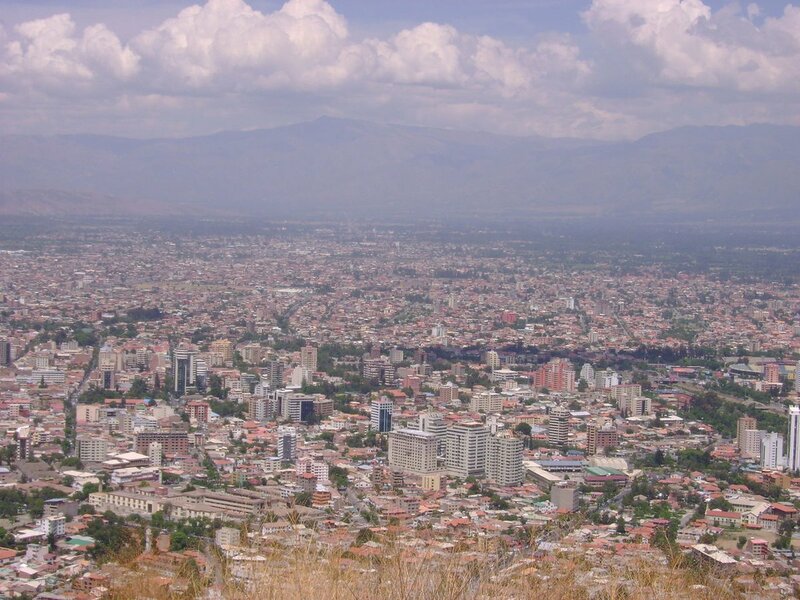 Thanks to numerous parks and gardens, Cochabamba is often called the "garden city". The symbol of the city since 1994 is the statue of Jesus Christ on Mount San Pedro in the eastern part of the city. The height of the statue is 34.20 meters (together with the pedestal more than 40 meters), so it is 2 meters above the famous statue of Christ on Mount Corcovado, in Rio de Janeiro. On the mountain of San Pedro you can get on the cable car, and on certain days you can climb the statue itself, through the viewing windows of which you can see a panoramic view. In the center of the city there is an area on September 14, with an ancient cathedral. On it and around Columbus Square there are colonial-style houses, the rest of the city is built up in a modern style. North of Columbus Square is the wide El Prado Boulevard with institutions, banks, hotels and restaurants. To the south lies the market of La Cinca, which occupies several streets and squares. It is open seven days a week and is the largest street market in South America. La-Kancha arose from several scattered markets that grew after economic reforms in the mid-1980s. In the east of the city is the Main University of San Simon, one of the best universities in Bolivia. In the south-western part of the city, on the hills stretches the city park. In it, on Coronilla Hill, you can see a monument to women and children who defended the city during the liberation war of 1812, against the Spanish colonial invaders. The city has a wonderful archaeological museum. Denominations in numerals are repeated 3 times, in words - at the bottom.